Phanuel Habimana, Acting Director, Family and Reproductive Health Cluster for the WHO Africa Region, provided an overview of key issues in the region including the Millennium Development Goal (MDG) achievements and challenges in implementation. Many emerging priorities and opportunities were highlighted including the Sustainable Development Goals, Common African Position on the post-2015 agenda, CARMMA, the Agenda 2063- the Africa we want among others. Fannie Kachale, Director for Reproductive Health Services in the Ministry of Health Malawi, shared that high impact interventions, including family planning, nutrition, and skilled birth attendance, have been game changers towards their success. As one of the six countries on the continent to reach MDG 4 for child survival, Tanzania’s Neema Rusibamayila, Director Preventive Services, identified their success factors, e.g. scaling up immunizations and mobilizing strong political commitment from the President to enable prioritization of RMNCAH. Finally Laurent Musango, Regional Advisory Health Financing of WHO AFRO, focused on the impact of ebola across the three most affected countries demonstrating the challenges of weak health systems. 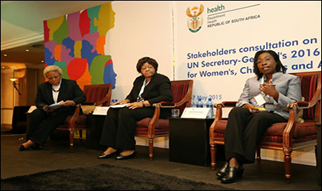 Focus on promoting Universal Health Coverage will be essential post-2015. The rich discussions and recommendations of the panel provoked an interesting exchange, and will help to shape the development of the revised Global Strategy over the course of the coming months.